Scholarships make it possible for thousands of students every year to attend college. For many college-bound students, the right scholarship can mean the difference between continuing their education or abandoning their personal and professional ambitions. The role that scholarship programs play in helping students achieve their educational goals can not be overestimated. Scholarships are made possible by the generosity of corporations, professional associations, college alumni, individual philanthropists, and colleges and universities. Without them, the post-secondary educational landscape would be very different indeed. One thing scholarship recipients tend to overlook, is the follow through. Too often students see the scholarship process as rather impersonal. But it is important to remember that scholarships are made possible by the generous donations of other people, and when students receive a life changing scholarship it is important to thank those individuals with a formal letter of appreciation. A letter of thanks to the scholarship board, or scholarship provider, does more than simply show the student’s appreciation for receiving the funds they needed to pay for college. A properly worded, formal letter of thanks acknowledges the importance of the scholarship program itself, and the impact the donors’ generosity has had on the life of a young college student. Philanthropists like to know that their contributions are making a difference. When they receive a thank you letter, they can see the difference their generosity has made and are more likely to continue to fund scholarships and grants for future students in need. After you have received your scholarship, it is important to take some time to compose a short letter of thanks to the donors and/or review board. Your letter should be sincere, without being fawning, and should express your appreciation for the award and the impact it has had on your life. The tone should be formal, but pleasant, and the body of the letter should run no more than a couple of well written paragraphs. Sending scholarship thank you letters should be handled through traditional mail. While you may have applied for the scholarship online, and much of the active correspondence may have been handled by email, formal thank you letters should always be hard copies sent through the traditional mail service. The letter should be printed on professional grade paper, and you should make a point of having someone proof read the letter to check for neatness, and to avoid any spelling or grammatical errors. When composing your scholarship thank you letters, keep the following tips in mind and try to hit all of the salient points as naturally as possible. Mention the scholarship program by name. Donors may contribute to a number of different programs, and it is important to let them know which scholarships are having the greatest impact. If you are finding it difficult to compose your scholarship thank you letters, refer to our section on Thank You Letter Samples and Templates. Of course, it will be necessary to find out to whom you will be sending your thank you letters. If you received your scholarship award through your college or university, contact your financial aid adviser or department head for the information you need. They should be able to provide the names and addresses of the people to whom you will be sending your thank you letters. 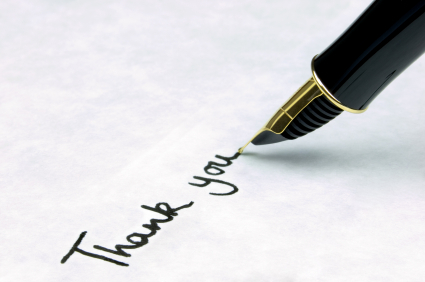 Many colleges and universities actually have protocols in place to help students with their thank you letters, and are already prepared to walk them through the process. If you received your scholarship from a private source or a charitable organization you will need to contact the review board for the information you need. Once your scholarship has been approved, contact the review board and ask them politely where you can send your letters of thanks. If the review board supplies you with more than one name, be sure to send letters to them all. Scholarships play an integral role in helping students realize their educational and professional ambitions. The donors who make these scholarships possible do so out of an understanding of the importance of helping talented students achieve their full potential. That generosity should not go unnoticed, and students should make a point of sending a well constructed thank you letter to all of the individuals and organizations who have helped them in their quest for a college education.